S. epidermidis growing on an agar plate. "We have identified a strain of Staphylococcus epidermidis, common on healthy human skin, that exerts a selective ability to inhibit the growth of some cancers," said Richard Gallo, MD, PhD, Distinguished Professor and chair of the Department of Dermatology at UC San Diego School of Medicine. "This unique strain of skin bacteria produces a chemical that kills several types of cancer cells but does not appear to be toxic to normal cells." "There is increasing evidence that the skin microbiome is an important element of human health. 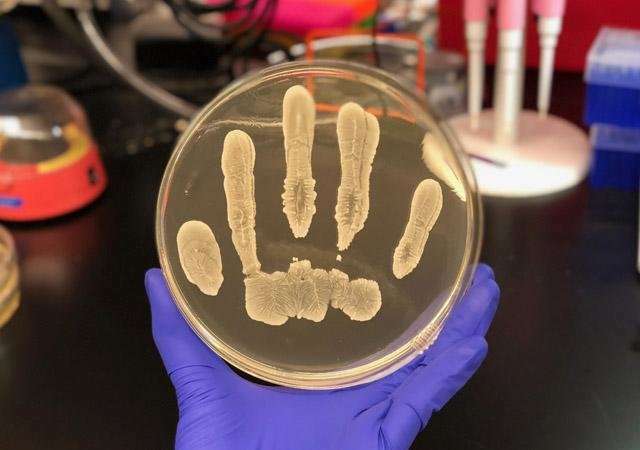 In fact, we previously reported that some bacteria on our skin produce antimicrobial peptides that defend against pathogenic bacteria such as, Staph aureus," said Gallo. More than 1 million cases of skin cancer are diagnosed in the United States each year. More than 95 percent of these are non-melanoma skin cancer, which is typically caused by overexposure to the sun's UV rays. Melanoma is the most serious form of skin cancer that starts in the pigment-producing skin cells, called melanocytes. Conclusion? Don't take a shower every day? Don't use antibacterial soap & hand sanitizer? Don't use cleaning products that 'kill 99% of bacteria'? What destroys our skin ecological balance?